Is it just plain naive to think that one couple on the train wreck of 90 Day Fiance could really, truly make it? Because I want that for Evelyn and David, young lovebirds who seem smitten with one another, are (somewhat) age-appropriately matched, and who share core values. Alas, the TLC machine might chew them up and spit them out by the end of season five, but until then, let’s pretend they are the real deal, okay? We need this! In addition to Evelyn and David being introduced this week, we revisit the absolute sh*tshow of everyone else’s relationships. Nicole holds her daughter hostage goes to Morocco to further torture Azan, the other David (in Thailand) tries in vain to come up with enough scratch to pay for his bride, Annie. And Molly continues to delude herself into thinking that her much-younger fiance, Luis, is the love of her life – despite her eldest daughter’s protestations, not to mention her father’s warnings. We asked, we believed, and we received! 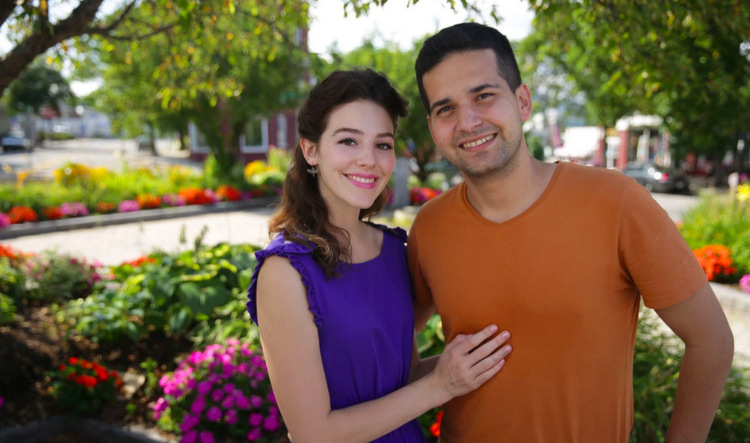 TLC’s 90 Day Fiance has scrounged up another batch of betrothed couples from across the globe to show us just how dangerous the internet can be. Yes, five brand new couples and one set of familiar faces (hello Nicole and Azan!) are poised to broadcast their epic travails of love and con-artistry for our viewing pleasure. For all of you long-time 90DF fans, welcome back, friends! For those of you wondering, WTF is this show and why should I watch it? I implore you: SET YOUR DVR NOW. You’re welcome, in advance. As a reminder, the premise of this show follows American men and women who have fallen in love with foreigners who, when they arrive in the U.S. on a K-1 “fiance” Visa, will have exactly ninety days to marry their captors partners. Joining Nicole and Azan this season are newcomers Elizabeth and Andrei, Annie and David, Aika and Josh, Molly and Luis, and finally – the number one contenders for actual love and happiness (how refreshing!) – Evelyn and David. Last night’s premiere introduced us to most of the couples, and there’s a lot to dissect – so let’s get our dumpster diving on, shall we!